Kathie Krug holds son Duncan as she speaks at news conference. The group “Iowans 4 Medical Cannabis” is urging Iowa voters to press this year’s political candidates to support legalizing marijuana for broad medical use. 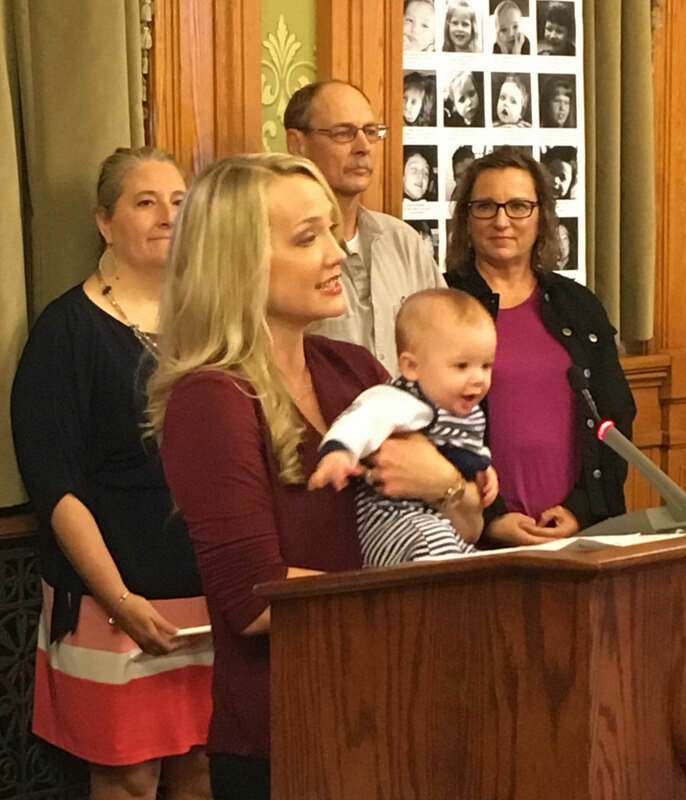 “We are asking voters to ask their candidate what they will do to help suffering Iowans who need access to this treatment option in Iowa, produced, tested and dispensed by Iowans, for Iowans,” says Sally Gaer of West Des Moines. Her daughter, Margaret, has been taking cannabis oil for 19 months as treatment for her seizure disorder. However, Iowa’s law which decriminalized possession of cannabis oil for treatment of chronic epilepsy will expire July 1, 2017. Gaer and other self-described “warriors” for medical cannabis say the law should be expanded, to include those who suffer from other conditions. Iowans 4 Medical Cannabis held a news conference this morning at the statehouse. Tom Duncan, a fifth generation farmer in Greene County and kidney cancer survivor, was among the speakers. Iowans 4 Medical Cannabis plans to post a list on the group’s website showing which incumbent legislators have supported providing access to medical marijuana in Iowa.